The contemporary visual arts sector is facing a number of key challenges and now, more than ever, a collegiate approach is needed to build a vibrant future for the sector. The national Contemporary Visual Arts Network (CVAN) is currently consulting with the regional networks to enable greater cohesion and a more strategic engagement with these challenges. CVAN wants to make sure its strategic plan is as responsive and effective as possible and so is currently liaising with the regional networks to gather people’s responses answers to three open questions. This data from across the regions will be complied to form a national strategic plan which will be published shortly after Easter 2018. 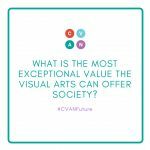 Tell us what you think is the most exceptional value the visual arts can offer society? If you could change or do one thing to improve support for artists, what would that be? What’s the biggest challenge in terms of support for artists, what isn’t working? Don’t forget to use #CVANFutureEM if you get involved via social media. You can also email us your views at info@cvaneastmidlands.co.uk and there’ll be a chance to get involved at our Annual Event, Another World is Possible, in Northampton next week. Read the latest update on the consultation.